The Cailleach awakens. Prepare for winter. She is coming! Well the ebb, and well the flow. Have they not come home to me? The Cailleach (KAL-y-ach), is the Crone Goddess of winter and transformation. She arises on Samhain night using a slachdan to control the power of winter cold, winds, and storms. A slachdan is a Druidic white wand of power, which is made of birch, willow, bramble, or broom. Wherever The Cailleach goes She strikes the ground with the slachdan making the earth harden with frost. As autumn progresses into winter She scours the land with Her cold breath, bringing snow and treacherous weather. At Imbolc The Cailleach hurls her slachdan into the root of the holly and gorse plants and She turns into a gray boulder until the Wheel again turns to Samhain. She is sometimes depicted as an old hag with the teeth of a wild bear and boar’s tusks or else is depicted as a one-eyed giantess who leaps from peak to peak, wielding Her magical slachdan blasting the vegetation with frost. The Cailleach sometimes assumes the shape of gulls, eagles, herons, and cormorants. Her name means the “Veiled One” and She is very old. No one knows for certain where She came from, when the Celts arrived in Ireland The Cailleach was already there. She has been called Old Wife, Old Woman and the Blue Hag of Winter. In Celtic myth the Hag represented the spirit of the land, and held sovereign power over the earth and kings. For a Celtic king to retain power he was required to “marry” the Goddess of the earth. The Cailleach is said to be responsible for raising mountains, and creating the ancient burial cairns and barrow mounds. She is a Goddess of the Underworld, associated with the ancestors and the realms of death and rebirth. 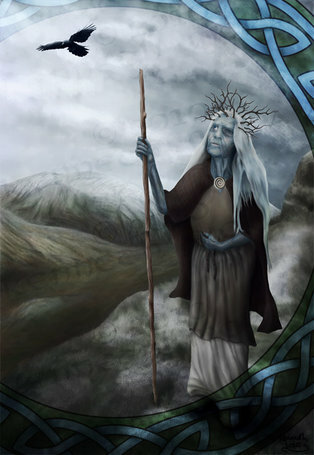 The Cailleach is connected to the bean sidhe (Banshee), the wild women of the Faeries, She haunts the faerie mounds and entrances to the realm of the Fey. You may also find Her near sacred standing stones, the “bones of the earth”. Her companion the Owl is also associated with death, the underworld, magic, and the ability to see spirits. As a Goddess of transformation and death, She oversees the culling of the old, and lets die all that is no longer needed. With the passing of the winter months, the Cailleach finds and guards the seeds for the coming re-birth of Spring. She stands at the cusp of life and death, intimately connected to the witches of old, the wise women who presided as midwives over birthing and who prepared the dead for burial. As the “Veiled One” the Cailleach guides us through our inner realities and dreams. She teaches us to let go of (allow to die) all that no longer serves our higher purpose and guides us through the many deaths and rebirths of our life’s transitions. She is the final phase of the Triple Goddess who rules the wheel of reincarnation. She teaches us to embrace the trans formative power of darkness and leads us into the light of re-birth.